This year’s Buffalo Bills are very intriguing. Really. They are. You may not believe me, but they are. I do realize this is much like the boy who cried wolf, pretending over and over again that he had big news, only to find no one would believe him when it was finally imperative that they did. Only in that story, the boy knew he was fibbing. Most Bills fans have been quite honestly and innocently duped by their own foolhardy, undying, overly-optimistic loyalty to the Buffalo Bills franchise, and a healthy dose of marketing by the well-oiled machine that spews forth powerful propaganda from the offices at One Bills Drive. Why do I believe this? What could possibly cause me to utter such utter nonsense? You may have read here before that the Bills are nearly completely different from the very top (Russ Brandon is now in charge of the Bills world) on down. All of the coaching staff is different, so many players retired or were let go—different, new players filling their voids—and probably most noticeable, as well as most notable—the Bills spent the sixteenth overall pick on their “quarterback of the future”. This from a franchise who had never in its fifty-plus years selected a quarterback with their first pick of the draft! There are regular reasons to be excited about this football team (good players) but I’d say the most intriguing aspect of the 2013 Buffalo Bills is the coaching staff. 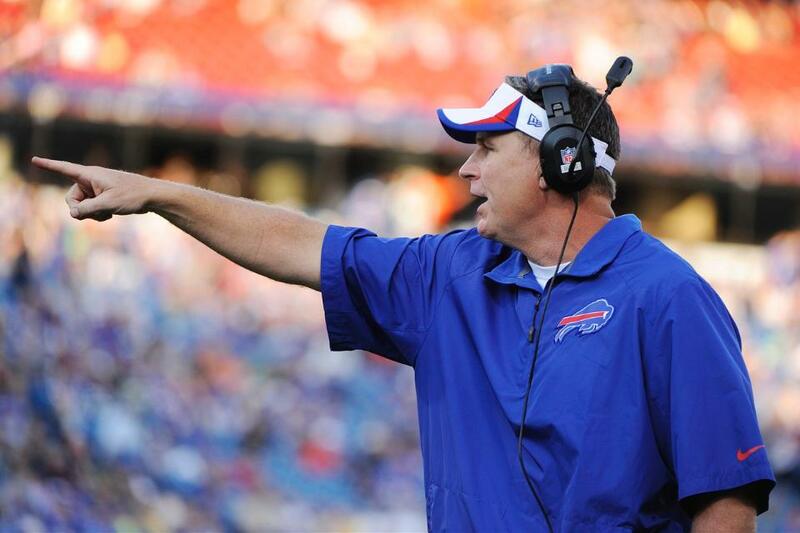 The previous staff was completely obliterated, and not too long after they were “dismissed”, Doug Marrone was hired. Please refer to my article from last January to review some of the thoughts that were swirling about inside the collective head of the Buffalo Bills fans after this hire, but needless to say, there was more unknown than dissatisfaction. Then he hired a few coaches, including Nathaniel Hackett as his Offensive Coordinator. Hackett previously worked for the Bills organization as Offensive Quality Control, or something like that. Basically, he played a very minor role. Not long after Marrone brought in the Syracuse University coaches that he wanted, he and Russ Brandon wooed the New York Jets defensive Coordinator for that same role on the Buffalo Bills coaching staff. He accepted. Now things were beginning to get interesting. Mike Pettine, the new D-Coordinator, is not as vivacious as the young coach Hackett, but he’s on the younger side of the NFL coaching scale, and he’s equally innovative. He’s also had great success everywhere he’s coached. Previously the Jets’ Defensive Coordinator, he also coached the Baltimore Ravens defense with Rex Ryan before that. Again, wherever he’s been, his defense has seen great success. The scheme fundamentally aims to fool the offense as much as possible—look like you’re coming with a blitz, from multiple positions, and then don’t. Or do. They’ll never know!—and apply MUCH pressure. Oh, and hit hard. Really hard. So far through training camp and two preseason games, that’s exactly what we’ve seen. 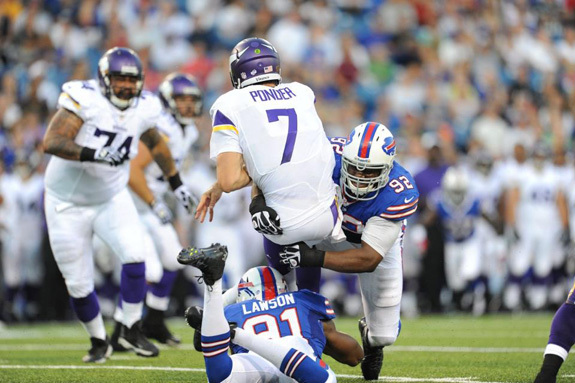 Offensively, the Bills are running around 80 plays per game (that’s a good clip!) and they are getting yards and points. Probably the first thing about the 2013 Bills that fans and outside observers would all label ‘intriguing’ is the quarterback competition. After drafting EJ Manuel number sixteen overall, him being the first QB taken by any team in the draft, many eyes are on that position battle. And why not? The Bills really haven’t had a great QB since Jim Kelly, over twenty years ago! There were flashes of fun with one year of Drew Bledsoe, and another of Doug Flutie … but then we’ve had the insufferable stretch featuring the likes of JP Losman, Kelly Holcomb, Trent Edwards and even the lovable Ryan Fitzpatrick. The expectations bar is of course set quite low for whomever might assume the role of primary signal caller, but beyond the obvious, this really is an intriguing time. Injuries have thrown an interesting wrench into the whole process. 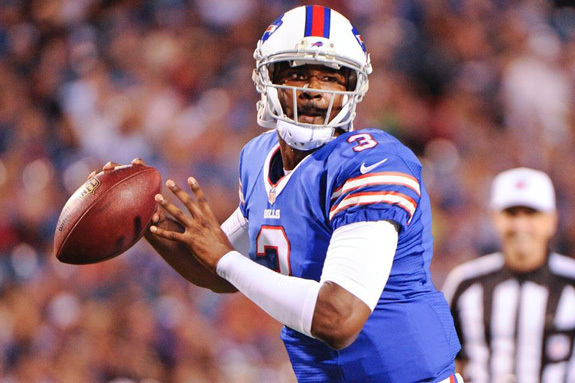 First, the veteran Kevin Kolb missed time because of a freak, off-field slip that hurt his knee (as well as some personal, family issues that he needed to tend to) and then news emerged after the second preseason game that EJ Manuel was having surgery on one of his knees following an injury sustained in that game. Prior to the injury, Manuel had been separating himself a bit from the other two QBs in camp practices as well as game play. His poise, decision making, and obvious athletic ability have been consistently better than Kolb. My theory is that EJ was only barely injured, and the coaches decided to (1) make sure he was better than OK before having him play anymore, and (2) since he was a clear front runner, they needed to see the other guys more anyway! 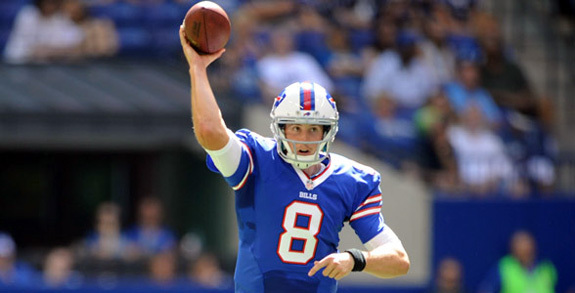 Bills fans, on the other hand, are going gaga for Jeff Tuel. “Tuel Time” mania is sweeping the Bills Nation! Jeff Tuel? Who? Indeed. The undrafted free agent has won the QB-starved hearts of Bills fans everywhere with his nearly flawless completion percentage, his strong, confident throws, and yes… touchdowns! We love touchdowns! At this point in the history of this franchise, we don’t care where you came from, your pedigree, or any expectations the NFL experts may have of you … if you get us TDs, you’re IN! Reporter: Where does Jeff Tuel stand in this QB competition. Is Jeff an option to play in week 1? DM: I think … it was interesting… when you draft… a lot of what we’ve seen publicly is a lot of the emphasis is on EJ & Kevin. Whether I miscommunicated that, or whether that’s what we wanted to see. But I think if you go back and you look in the beginning, I said, ‘Hey, you know, I really like this kid we took from Washington State, who’s really done a good job,’ and really everyone was like, ‘Eh… what is he talking about?’ And I think we’ve seen that he’s gone in there and he’s really done a nice job. So at the end of the day … yes, I want him to compete to be a starting quarterback. Then we’ll evaluate whether that’s good enough for us to win with. You can’t argue with the young guy’s success! 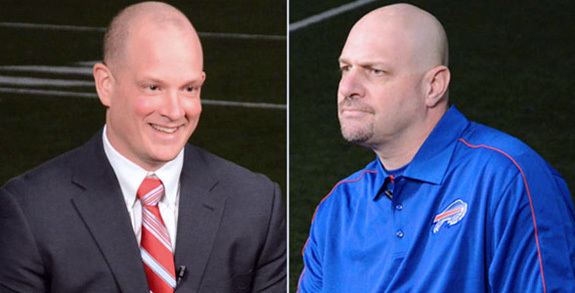 Is it really possible that the Bills would field TWO rookie QBs in 2013? It’s possible. The Redskins had two rookies as their numbers one and two last year. The Bills may follow their lead with Manuel and Tuel being their one/two in 2013. One thing that might be overlooked by some about these Bills is their speed. 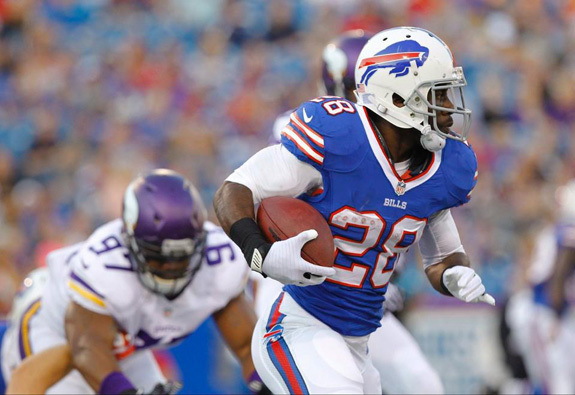 CJ Spiller is already one of the fastest men in the NFL at any position. Brad Smith is faster than most people realize. And CB Leodis McKelvin led the league in punt return average last season thanks largely to being fleet of foot. This year, the Bills have added even more straightaway speed by drafting WR Marquise Goodwin, who was also an olympic track athlete. He joins TJ Graham, drafted in 2012, who also has track speed in his dossier, being a track runner himself. (Even Graham’s mother was a track star!) He has only improved on his sub-4.3/40 speed in 2013, as well as improved his game as a receiver. Many reports from offseason workouts were saying that Graham has been the player to watch. So there is offensive team speed. Ridiculous team speed. I heard an interview with the Madden 25 player ratings guy, and he said there are four receivers for the Bills with 90+ speed ratings. “You’re going to like your receivers,” he told the Buffalo-based interviewer. But the defense is just as fast. Quick to the ball. Running all over the place. Watch out for the linebackers this year. Rookie LB Kiko Alonzo looks to be the starter at the middle line-backer position, and he’s so far done really well. 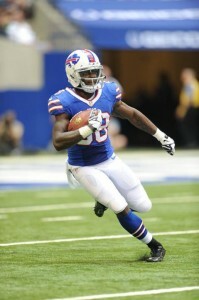 Guys like Manny Lawson, Jerry Hughes, and a few others are flying to the ball so far in training camp and preseason. The speed of this group is very intriguing! It would stand to reason that a team who has failed to make the playoffs for thirteen consecutive seasons might begin to accumulate very talented players. The system is set up to reward the worst teams with the best upcoming talent. So it’s not completely unbelievable to say that there are some very talented players on the Buffalo Bills roster. But then, we also have the history of the past thirteen years. We know what the Buffalo Bills do with that talent. Generally, they squander it. And sadly, players like Eric Moulds, Lee Evans, Aaron Schobel, and a healthy amount of other players have toiled in relative NFL obscurity because of their team’s lack of success. One could ply the chicken-or-the-egg argument here, of course. Couldn’t lack of team success be a result of a lack of talent? (And thus, that deserved obscurity.) Perhaps. But I’m going to say that many players who’ve donned the Red, White and Buffalo Blue have been unfairly forgotten by much of the NFL universe because of the black hole that this franchise has been for so long. Now, despite this reputation—which again, is quite well-earned—the Buffalo Bills roster boasts some true NFL stars. CJ Spiller became a well-known name last year as he continually ripped off really long, electrifying runs—true highlight reel material. Stevie Johnson is the only Buffalo Bills receiver to post consecutive, thousand-yard seasons. Only. Ever. On a list that includes all-time favorite Andre Reed, Hall of Famer James Lofton, and the aforementioned Eric Moulds. And Stevie’s done it THREE consecutive seasons. WITH Ryan Fitzpatrick and Trent Edwards. Guys. There’s something … a LOT… to that. He’s really good! On defense, the backfield boasts two relatively young NFL stars: Jairus Byrd and Stephon Gilmore. Who? Again, the obscurity of ineptitude. Jairus (who just signed his Franchise Tag Tender contract while I was finishing up this article!) 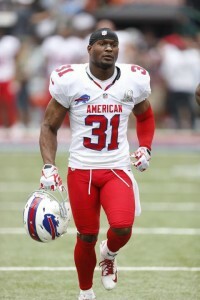 is a Pro Bowl safety, who led the league in interceptions in his rookie season. He continues to be the “ball hawk” type, aided by his fellow backfield mate, Stephon Gilmore. Only entering his second year in the league, Gilmore has already been labeled a “shut down corner”, which just means he’s really good. Don’t forget $100M Mario Williams is on this team, and, DT Kyle Williams, whom many feel is the best player on the Bills defense—maybe the team! And, while you can’t call rookies “stars” just yet, don’t forget that EJ Manuel brings some level of “star power”, as do Kiko Alonzo, an aggressive and talented MLB, and super-speedy WRs Robert Woods and Marquise Goodwin (who already has a 107-yard kick return TD on his NFL stat sheet!). This whole team looks really, blazingly fast! In addition to the draft, the Bills actually seem to have done pretty well in other offseason moves with the line-backer pair, Jerry Hughes and Manny Lawson creating consistent pressure (havoc!) in training camp and the first two preseason games. These players will not be the “face of the franchise” yet, other than Manuel, but they may be someday soon. All I am trying to say is, this year’s version of the Buffalo Bills will almost certainly be intriguing. They are a completely different team. Wholly. The only parts that remain from any years past (including only one season ago) are what most would consider the best parts (Spiller, Jackson, Johnson, Byrd, Williams, Gilmore, etc.) They even released K Rian Lindell this week. He’d been the Bills kicker for 10 seasons, leaving the franchise as the most accurate kicker in its history, and only 38 points away from being its highest all-time scorer, too. From players to coaches, to general manager, to the man calling the organizational shots: these are not the same Buffalo Bills. And honestly, that is what is intriguing. I have no idea if they will win. I think they can? But I have no idea. I have no reason to think that they won’t, simply because these people who are wearing the Bills’ colors are nearly all NOT the people who have been for the past 10-15 years of complete incompetence. That seems like a good thing! The season starts in just a few weeks, and you can bet that we long-time Bills fans will be clad in red-white-and-blue at 1pm on September 8th, anxious to see what this rendition of our Bills can do. Yes. I know. But if you’ll notice, I carefully avoided any “this team is going to the playoffs!” predictions, or any other such, “and they’re going to be awesome!” pronouncements. I merely stated (repeatedly) that they are intriguing. Surely even your curmudgeonly annual pessimistic outlook (for your favorite team) can concede that, no? Now we will see if that can translate to enough wins (in a still-tough division!) to actually matter. At least, barring major injuries, they will be fun to watch this year. When’s the annual game at the Drake house? A couple years ago, that was the streak-breaker against NE!